Dexter J. Singleton is originally from Detroit, Michigan. He currently serves as Founder/Executive Director of Collective Consciousness Theatre, a multicultural theatre company dedicated to social change through the art of live theatre, workshops and community conversations. He is a former company member of the world renowned Mosaic Youth Theatre of Detroit. He went on to create the critically acclaimed Kalamazoo Youth Theatre, a program for youth ages 10-18, creating original work for and about youth and families. Founded in 2007, Collective Consciousness Theatre has reached more than 50,000 youth and adults with innovative artistic programming. Dexter is a working director, actor, and playwright of seven produced plays. His recent directing credits include This Is Modern Art, Give Us Free, Rumors and Silver Bullet. His work has been seen at Long Wharf Theatre, Yale Repertory Theatre, Hartford Stage, Elm Shakespeare Company, Passage Theatre and others. 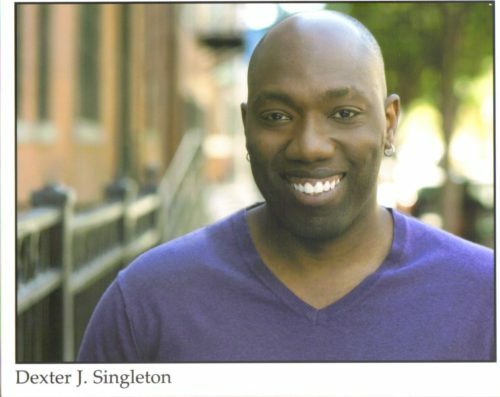 At Collective Consciousness Theatre, Dexter has worked with playwrights Dominique Morisseau, Idris Goodwin, Will Power and produced more than twenty productions featuring the works of our nation’s best writers. In 2010, Dexter was named Young Audiences of CT Artist of the Year for more than a decade of excellent work in schools across CT. Most recently he was given a 2014 National Artist Teacher Fellowship. Dexter often travels the country teaching original social change theatre workshops and doing residencies at colleges and in communities both big and small. He currently holds teaching positions at Regional Center for the Arts in Trumbull, CT where he is the Head of Theatre and as an Adjunct Professor of Theatre at Housatonic Community College. He also sits on the Board of Directors for the Arts Council of Greater New Haven, TYA/USA, and the Elm City YMCA. Dexter is a member of TCG and TYA/USA. He lives in New Haven, CT with his wife Erin. He believes Theatre has the power to make the world a better place.